Home / Blog / If I Have My Cake, Why Can’t I Eat It? We all know what is meant when someone says, “You can’t have your cake and eat it too.” They mean you can’t have it both ways. Sometimes choices are mutually exclusive. You can’t avoid exercise and eat whatever you want and still be fit. You can’t be a devoted family man and a workaholic at the same time. Kids pay more attention to these expressions than adults. I guess this is because they haven’t become cliche to them yet. I know when I was a kid this cake proverb made no sense to me at all. I understood the intended meaning, but I didn’t see how the words lined up. I mean, how can you ever eat cake if you don’t have it? And once I have it, what’s to stop me from eating it? It seemed perfectly obvious that if someone had cake, that it was possible–probable even–that he would eat it. Hostess: Brian, have some cake! Me: Um, can I just eat some cake? Of course have doesn’t always mean eat. In fact, it rarely does when you aren’t talking about food. Another reason this adage confuses people is that we tend to think about it chronologically. First you have, then you eat. The conjunction and can imply a time order: He snagged the grounder and threw it to first base. I ate the bad guacamole and ran to the bathroom. But and need not imply a sequence of events. In the proverb we’re discussing, it means and also rather than and then. 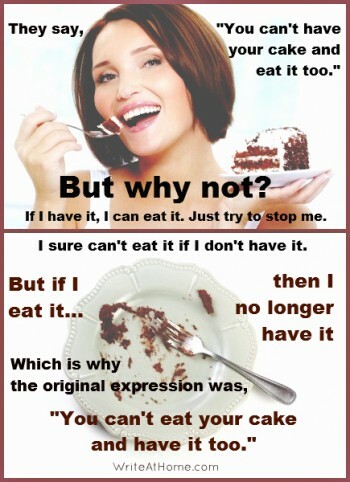 What I’m saying is that the expression “You can’t have your cake and eat it too” is not incorrect. If I apply an incorrect meaning to the words have and and, that’s my fault. But I do prefer the original version because it is clearer and less likely to be misunderstood. According to Wikipedia and several other sites I checked, the earliest published version of this saying is from 1546. It was in a work by John Heywood. He said, “Wolde you bothe eate your cake, and have your cake?” In 1611, John Davies put it in a more familiar form: “A man cannot eat his cake and have it still.” The first published instance of the saying with the clauses reversed appeared in 1749. So, people have been messing it up for a long time! According to Ben Zimmer, it was around 1940 that instances of the have/eat version became more common than the eat/have one. I hate to admit that the Unabomber and I have anything in common, but I guess we both prefer the eat/have version to the more common have/eat. I’m just not going to be a snob about it. And I’m definitely not blowing anything up. By the way, if you like my little virtual poster above, feel free to share it on Pinterest, Facebook, or wherever. Comments, please? Scroll down and share your thoughts. Because when you eat it,you don’t have it any longer. the two are mutually exclusive. Liver does not rhyme with silver. Perhaps you were thinking something more like liver rhyming with sliver? does that mean we should not use the initial version again?